Vegan & Vegetarian Destinations along the Capitol Corridor - Get on Board! With the booming veg scene in the Bay Area and parts of Northern California, plant-based foods are becoming everyone’s favorite. Whether you’re a vegetarian, vegan, or a carnivore with veggie aspirations, each of these restaurants offers a unique flavor and atmosphere, all along (or not too far from) the Capitol Corridor train route. This healthy, organic café offers mostly vegan options, but has exceptional cheese add-ons. 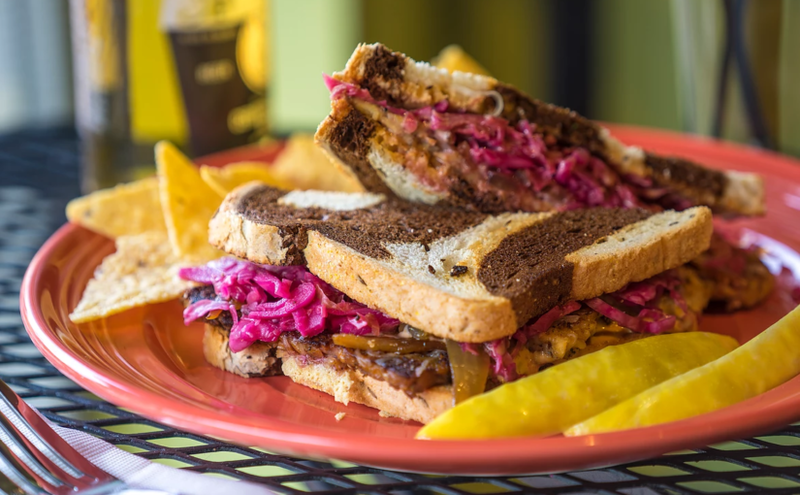 Located on Lincoln Way in Auburn, the Nectar Cafe’s menu features sprouted nut-based sauces with ready-made wraps, healthy bowls, sandwiches, and “Off the Grill” items such as their taco plate, tempeh reuben, and more. Take the Capitol Corridor to the Auburn Station, which is a short bike ride or 20 to 30-minute walk to the café. Formerly known as Baagan, Zest Kitchen in Rocklin offers stylized coffee substitute drinks, fresh wraps and sandwiches, as well as gluten-free options. If you prefer a hot meal, try out their signature Zest veggie burger, with a patty made from sprouted beans and veggies, along with vegan, house-made “white cheedar” sauce, fresh tomatoes, and lettuce. If you’re feeling healthy and full-on veg, this place is a must. Take the Capitol Corridor to the Rocklin Station, which is a short bike ride or 35-minute walk to the destination. Located in the farm-to-fork capital, Andy Nguyen’s Vegetarian Restaurant in Sacramento is well-known for their peaceful, spiritually-inspired dish names such as “Divine Realization” pad thai and “Awakening of Faith” rice noodles (made with grilled tofu, shiitake mushrooms, lettuce, cucumbers, sprouts, and more!). With many vegan options available on the menu, this place is a must for veggie lovers. Take the Capitol Corridor to the Sacramento Station. From there, connect to SacRT with a free Transit Transfer from the Capitol Corridor, or call a cab, Uber, or Lyft. Don’t be fooled by the name! The Butcher’s Son in Berkeley is a vegan butcher shop and delicatessen. Located in Downtown Berkeley, their menu features all plant-based vegan meats in sandwiches such as the pulled pork and bacon patty melt. Their menu changes regularly, so you’ll have lots to choose from. Ride the Capitol Corridor to the Berkeley Station and take the AC Transit bus with a free Transit Transfer from the Capitol Corridor. You can also take the train to the Richmond Station or the Oakland Coliseum Station, transfer to BART, and get off at the Downtown Berkeley Station, which is a six-minute walk to the The Butcher’s Son. Discounted BART tickets are sold in the Cafe Car. If you have a sweet tooth, look no further! Mr. Dewie’s Cashew Creamery’s non-dairy ice cream is not only made of healthy ingredients, but it is also soy free, gluten free, and additive free! The ice cream cones come in your choice of vegetarian or vegan, and with delicious ice cream flavors such as Mocha Chip and Caramel Almond, it’s a great way to enjoy the hot weather without feeling guilty. Take the Capitol Corridor to the Emeryville Station. The creamery is in the Emeryville Public Market across from the station. This soul food restaurant takes classic favorites and adds a vegan twist to create menu items like vegan mac n’ cheese, chick’in and waffles, corn bread, gumbo, and more. Although most of their cuisine is on the hearty side, they offer lighter salads and soups. If you’re craving fried comfort food, however, you’ll love the abundance of it at this place. Take the Capitol Corridor to the Oakland Jack London Square Station. The restaurant is a short walk, less than half-a-mile, from the station. Rated over 4.5 stars on the popular vegan/veg online guide HappyCow, Shizen Vegan Sushi Bar & Izakaya in San Francisco offers all vegan sushi and small plates, including their ramen broth and noodles made from scratch. For seafood-like sushi, their menu features specialty rolls such as the “The Candlestick”, made with spicy tofuna, or an all-veggie specialty roll called the “Hidden Agenda” made with tempura eggplant, bell pepper, zucchini, carrots, and fried garlic. Be sure to get there before they open, as long waits are typical. Take the Capitol Corridor to the Oakland Coliseum Station or the Richmond Station. Then take BART and get off at the 16th Street Mission Station, which is just a six-minute walk to the restaurant. Discounted BART tickets are available for purchase in the Café Car. This European-style café offers breakfast items, smoothies, baked goods, salads, soups, and of course, crepes! The Crepes Bistro in Santa Clara has signature dishes such as the bagel burger, made with a veggie patty topped with vegan mayo and other yummy goodness, while offering their savory crepes, such as the Royal Veggie Crepe, made with choice of vegan or dairy cheese, roasted eggplant, mushrooms, lemon tahini sauce, and more. With a ton of brunch items on their menu, it’ll be hard to try them all! Take the Capitol Corridor to the Santa Clara University Station. From there, you can either walk, take the VTA with a free Transit Transfer from the Capitol Corridor, or call a cab, Uber, or Lyft. The cafe is over a mile away from the station. Vegan restaurant Good Karma Artisan Ales & Café serves craft ales and stouts, along with salads, Thai curry, burritos, and more. Established as the ‘South Bay’s Original Artisan/Craft Beer Destination’, this spot’s eclectic menu will not disappoint. Take the Capitol Corridor to the San Jose/Diridon Station. From there, you can walk, take the VTA with a free Transit Transfer from the Capitol Corridor, or call a cab, Uber, or Lyft. The restaurant is just a mile away from the station. To plan your culinary excursion along the Capitol Corridor, visit www.capitolcorridor.org for route and schedule information.